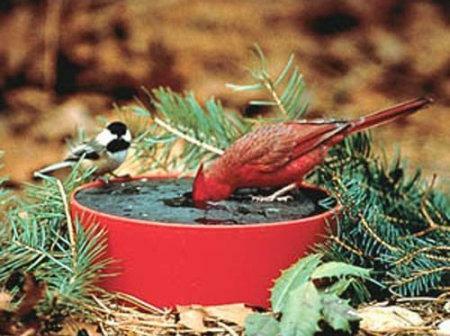 Winter sun is your friend when you want a low-cost, low-maintenance way to provide drinking water for wild birds. There are a few ways solar power can help to keep the ice at bay and the chickadees, mourning doves, and red-bellied woodpeckers well-hydrated. Moving water doesn't freeze and solar panels exposed to limited winter sun can power a small fountain to keep the bird bath contents liquid. When water molecules are in motion (kinetic energy), they bounce off each other, moving farther apart. An increase in kinetic energy equals an increase in temperature which can be enough to prevent freezing. The colder the water, the denser the molecules until the water freezes. So a gentle fountain keeps the water molecules moving and separate; they cannot remain close enough together to solidify into ice. The soft sound of trickling water is also a heads-up to birds that water is nearby. Smart Solar makes a solar-powered birdbath, available at Serenity Home & Health Decor, that comes with a battery to store energy for overcast days. A small solar panel in the bowl of the pedestal birdbath runs a spray or spouting fountain. The flow is adjustable at the spout and the water can be turned on or off at the spout. At night, the battery will provide about 6 hours of energy for the fountain. Reviewers commented: "The fountain looks just mind blowing and the installation was also very easy" and "the ceramic finish is very easy to clean, always keeping the water fresh." The Ashbourne model comes in an aged granite or oiled bronze finished resin, costs zero dollars to operate, and sells for about $200 at Serenity Health & Home Decor. Shipping is free. A vivid blue ceramic model, the Athena, is a showier style with the same solar technology for about $250. Heating water in freezing weather outdoors is a real energy drain. You can inflate your electric bill by $3 or more per day running a power birdbath heater to prevent icing. That's bad for the environment and bad for your bottom line. But leaving your backyard birds to fend for themselves in the cold isn't much of a choice. Unfortunately, choice is in short supply when you're hunting for solar-powered birdbath heaters. The amount of power required to heat the water is beyond what a simple submersible, floating or post-mounted small solar panel can supply. And when there's no sun, there's no solar heating to keep the ice at bay. However, you can find some solar options that will help keep the ice at bay. Be inventive. Use Mother Nature to take care of her own by borrowing some warmth from the sun at every opportunity. Clean out your winter-tough summer birdbath (metal, resin, and plastic will survive winter temperatures without cracking) and then line it with a black plastic trash bag or black plastic sheet to absorb the sun's rays. If ice does form overnight, lift it out of the basin in the plastic liner, dump the ice, replace the liner and add clean water. Float a clean rubber ball on the water to break up any ice crystals. Relocate the summer-shaded birdbath to full, unobstructed sun -- if possible, in a spot protected from harsh winds -- during the winter months. The Happy Bird Solar Sipper is available through Walmart for approximately $50. It has a solar panel that fits over the top to keep water from freezing. There's a small circle in the center that allows birds to drink the water. Another option is the Solar Sipper by Duncraft. It's a passive solar heater that keeps water from freezing on days as cold as 20 degrees Fahrenheit. A bright red basin attaches to a post, porch railing, or tree with an included bracket. Inside the red water reservoir, a black plastic disc acts as a cover and absorbs the sun's heat to keep the water warmer. A small opening in the center of the disc allows convenient sipping. There are no pumps or filters to worry about, just install it in a sunny spot and keep the reservoir filled. But the manufacturer recommends taking the sipper in at night to protect the plastic and, if you live in a true winter climate, the temperatures may get too low for this solar warmer to do its job. One customer remarked: "Design makes it super easy to clean…I easily attached it to a wood support pole on our back deck in full sun, so I expect it will work well under normal winter conditions." The Solar Sipper is on sale from Duncraft Wild Bird Superstore for about $30 plus shipping. If you have a large yard, or bird-friendly neighbors, and order multiples, you can get free shipping on orders of $75 or more. You're only limited by your imagination when you build your own warming solar birdbath. 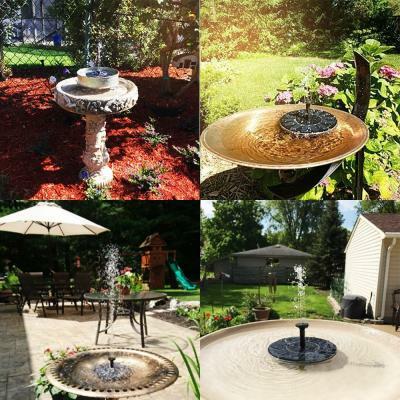 Free-floating and small self-contained solar fountains are inexpensive and you just set them inside your choice of basin. More techy types might experiment with solar panels that power water recycled from a reservoir -- a do-it-yourself reservoir fountain. The simplest homemade solar-powered designs use heat-absorbing materials which keep water from freezing when the sun is shining. Metal absorbs the sun's heat rapidly and you can use a sheet of metal encased in a simple pedestal following directions from Build It Solar to warm the water in a shallow basin set on the top of the pedestal. A 1/8-inch galvanized steel panel, angled slightly upward and housed inside an insulated wooden pedestal, will warm a pie plate or another shallow basin fitted into a cut-out hole in the top of the pedestal. That keeps the water from freezing and heats up night-chilled water every morning when the sun comes out. A Plexiglass panel forms the south-facing front side of the pedestal. The sun shines through the clear panel, heating the steel in its insulated container, and that heat melts the ice in the shallow basin, or keeps it from freezing as long as the sun is out. Zero energy cost and very low maintenance; just be sure to keep the basin filled with clean water. Secure a large glazed ceramic saucer or shallow basin to a patio wall or porch railing that gets full sun. Fill it with water and set a self-contained solar fountain in it. A couple of partly submerged river rocks will keep the fountain from free-floating and interfering with thirsty birds. The solar fountain prevents ice from forming as long as there is sunshine; there is no storage battery, so it shuts down when the sun does. This option works best when the solar fountain is removed at night and set out with fresh water every morning. Winter is hard times for wild creatures and why wouldn't you help a bird out when you can? Whether you invest in a fancy solar-powered double-decker fountain, an inexpensive porch-mounted plastic heat-keeper, an original artwork that harnesses the sun to warm water in your own brilliant design, or some cheap tricks that you check on daily for a little ice-breaking and refilling, you can keep things warbling and chirping in your yard or garden and avoid a deep freeze. Experiment to find the solar option that's right for your climate. 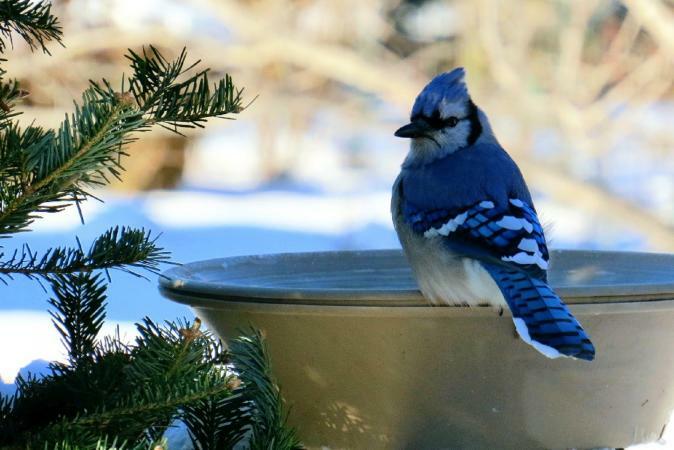 And place your sun-warmed birdbath high enough off the ground and in the clear so no predators can disturb your fine feathered friends while they're gathered at their winter watering hole.